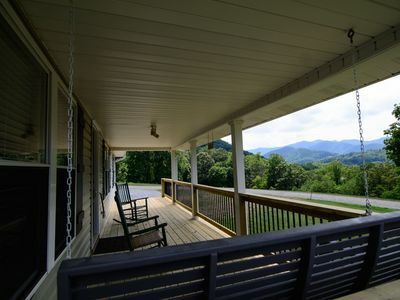 Discover the Blue Ridge Mountains from this 1-bedroom, 2-bathroom Swannanoa vacation rental cottage that boasts 1,350 square feet of modernly rustic living space and sleeping accommodations for 2. 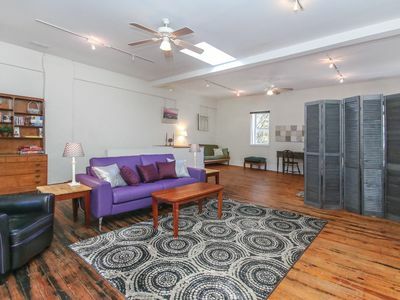 The perfect spot for a romantic getaway, this home offers a welcoming interior and a spacious, groomed yard. 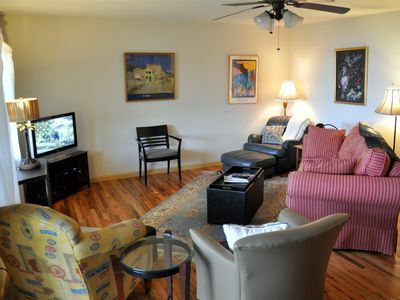 Explore Black Mountain, lounge by the outdoor fire pit and indulge in Asheville’s unique culture, which is only 15 minutes away! 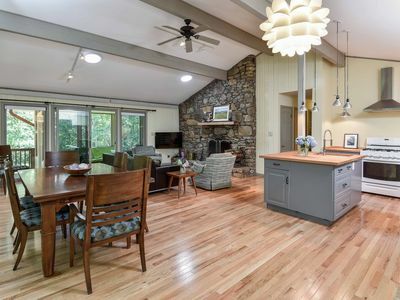 This fully restored cottage is beautifully outfitted with stylish, high-end accents and rustic wood floors and ceilings. 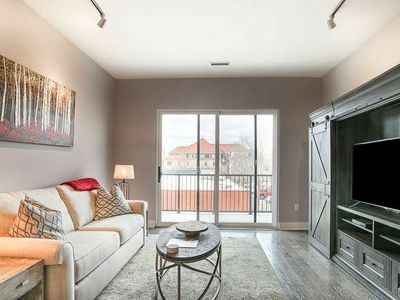 An open-concept layout creates a spacious feel and easy flow throughout. 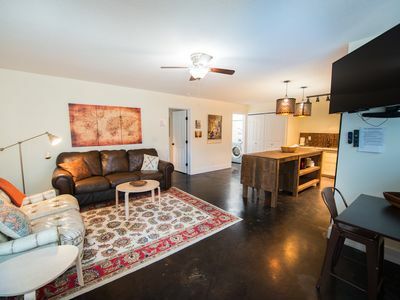 If you need some down time after your travels, decompress in the inviting living area, which includes a comfortable sofa, ottoman, and flat-screen TV equipped with Roku. Prepare a hearty breakfast to fuel your day in the fully equipped kitchen. 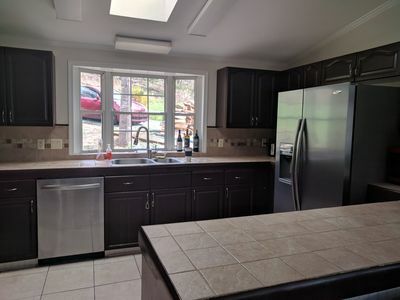 The space features granite countertops, beautiful wood cabinets, a tile backsplash, stainless steel appliances, and a breakfast bar. 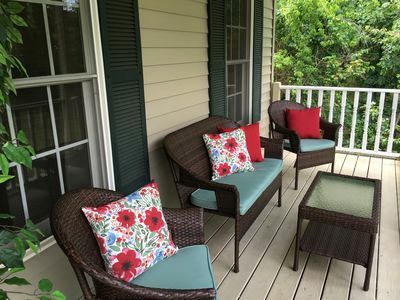 Dine at the kitchen table set for 4 or take your food out to the patio table, which offers an umbrella for protection on sunny or rainy days. 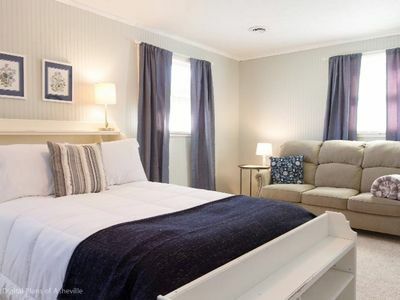 Just off of the kitchen, you’ll find the spacious bedroom that offers a plush king bed, flat-screen TV with Roku, and a huge en suite bathroom. Soak your aching muscles in the Jacuzzi tub before crawling into bed for a restful night of sleep. 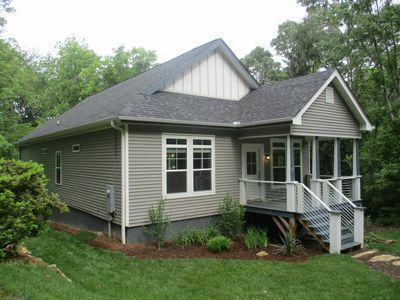 An outdoor enthusiast’s dream, this home is within minutes of numerous rivers, nature trails, golf courses, and more! Practice your swing on the golf course before taking in the mesmerizing views of the Blue Ridge Mountains. 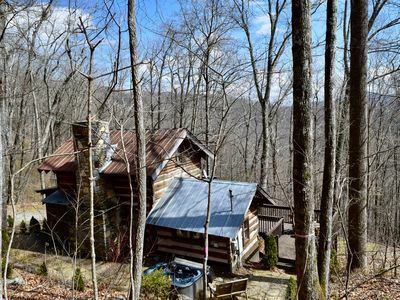 Maggie Valley, a town in Haywood County, is only 30 minutes from the property and is home to Ghost Town in the Sky, as well as Cataloochee Ski Area. 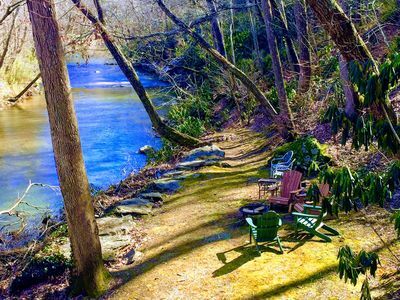 When you’re interested in immersing yourself in a unique culture, head into Asheville, which is only 15 minutes away. Here, you’ll find a surplus of breweries, restaurants, shops, museums, art galleries, and more! 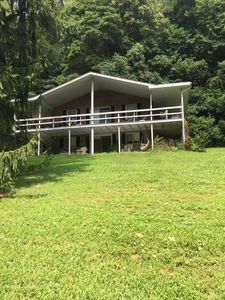 Beautiful 3/2 Treetop Home In Black Mountain ~ Walk To Lake Tomahawk! 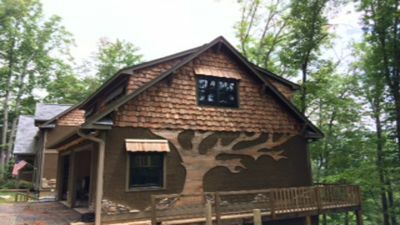 Newer Home in N. Asheville that helps Support a local Nonprofit. 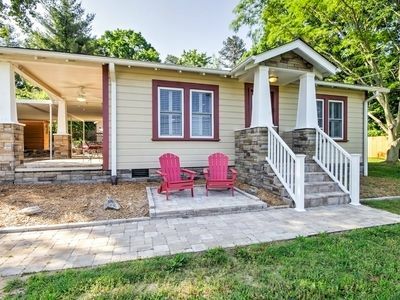 Bungalow in the middle of Asheville. 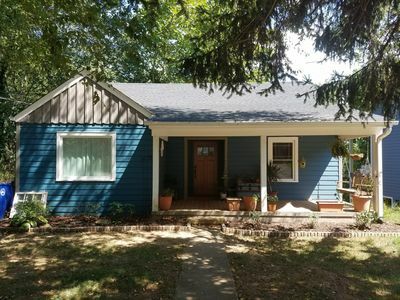 Minutes to downtown and Biltmore Estate. Located in the Village of Cheshire, Black Mountain! 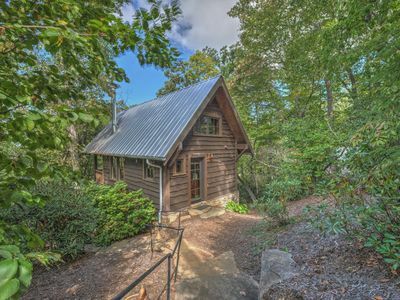 Cozy, updated cabin. Includes Biltmore! 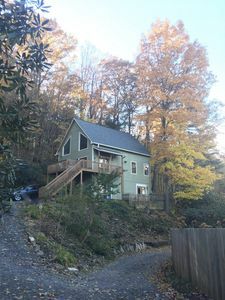 Charming Asheville riverfront cabin, 10 minutes from downtown! 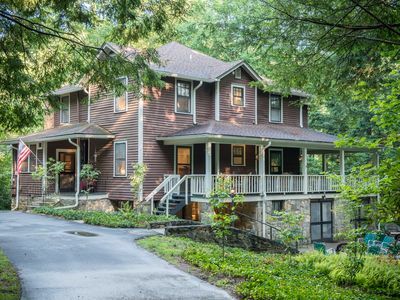 Great house minutes from Asheville and the Parkway. 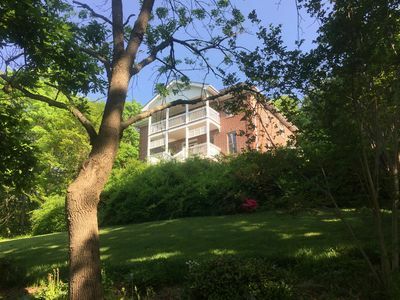 Top of the Hill is located on a quiet street with off street parking available.